Ever tried rolling up your jacket and using it as a makeshift pillow for the airplane, car, train or bus? It doesn’t work so well, does it? At some point it starts to slip down and unroll and then your head clunks against the window and your sleep is ruined. Most people can’t just sleep anywhere, and it’s nice to be able to catch up on your Zs when you’re traveling and need to get on a new schedule. Neck pillows are okay, but they don’t block out light or keep you warm or hold any of your stuff. They also don’t pack very small, or if they do, you have to blow them up to use them. Napper may be the answer to all your commuting sleep problems. Designed for travelers who spend a lot of time on busses, it is also great for all other forms of transportation, including road trips. 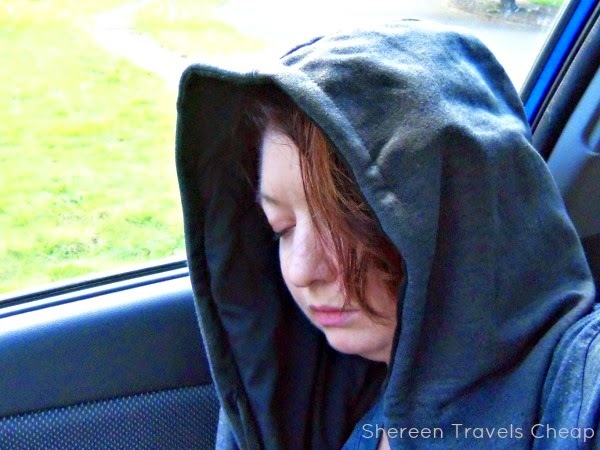 Napper combines the best part of a hoodie, a scarf and a pillow, all in a convenient little package. 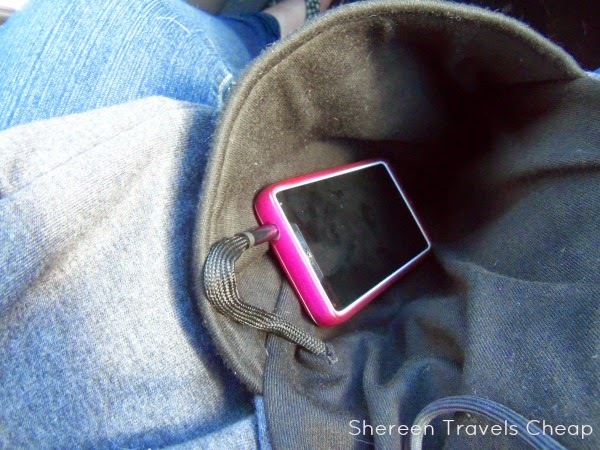 It folds up small to fit in your carry-on or a jacket pocket, plus has its own pocket to keep items on-hand when folded up, and two big pockets when unfolded. The Napper is super soft and feels great against your skin. It’s like your favorite sweatshirt. 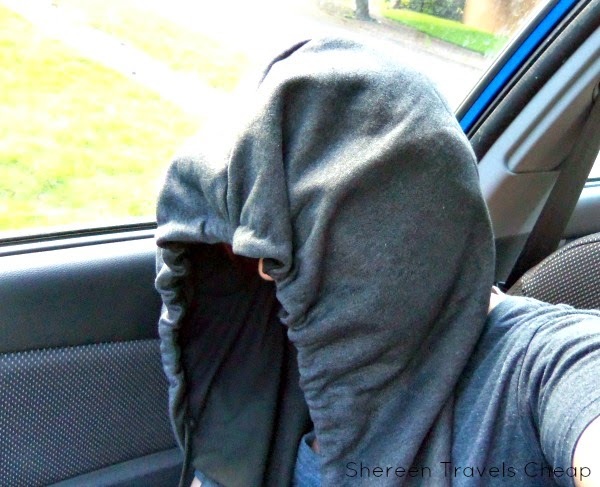 Throw the hood on and you’ve got sweet padding over both of your ears, so when you lean up against the window (or a wall if you are unlucky), you can sleep easily even through bumps and turbulence. So much better than being woken up with a big knot on your head. Is it too bright out, or just don’t want people looking at you while you sleep? Napper has drawstrings like a normal hoodie to pull the fabric down over your eyes and blocking out the sun – or your neighbor’s reading light. It also keeps those plane air vents from freezing you to death. Even on a flight that’s hot, I can never turn mine on because having it blow on the top of my head gives me a headache and it blowing in my eyes is super bothersome and drying. 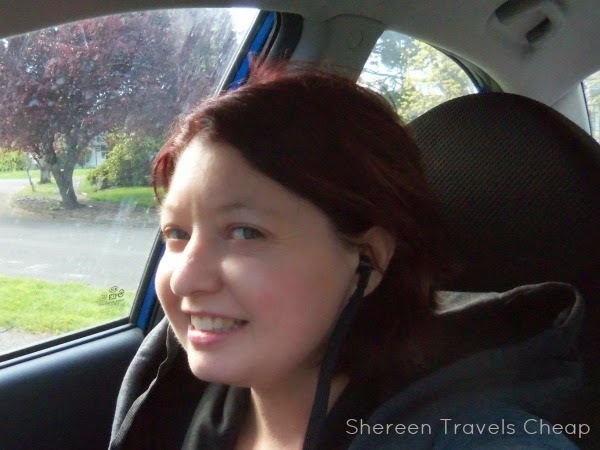 The drawstrings double as earbuds, so if you want to listen to music, play games or watch that in-flight movie, you can do it without extra cords, since the wire is hidden in the scarf and the jack for your phone or other device is in one of the pockets and won’t get all tangled up in your clothes or seatbelt. They have great sound when I used them to play on my phone. 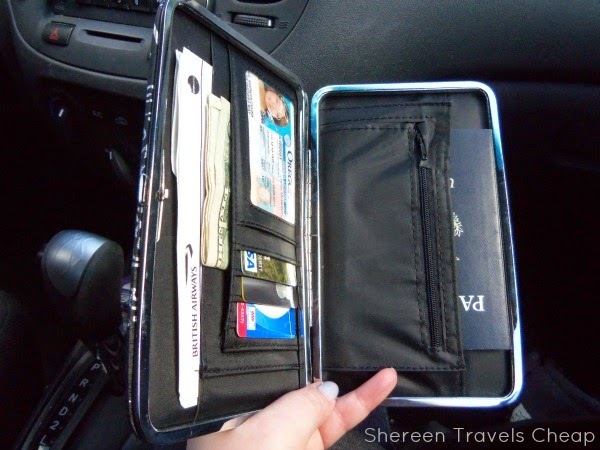 You can totally use the Napper to keep yourself organized while commuting or in the air. Keep all your travel docs, cash and even your ID or passport right on-hand without having to carry it all in your hands or dig through your bag when you need it again. Toss the scarf around your neck – hood on or off – and put those things you need in the pockets. 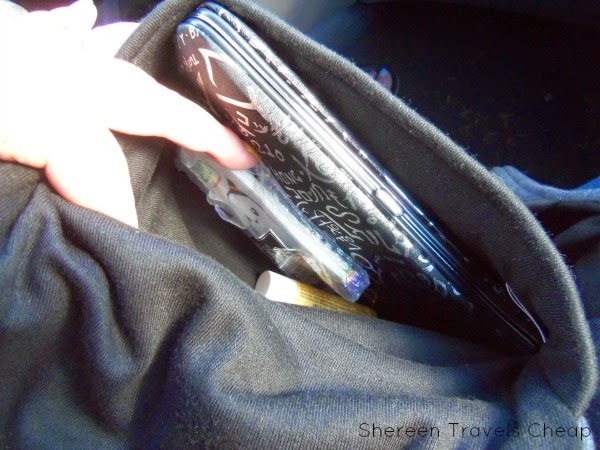 I’m always using my phone on-the-go, so I plugged it in (which also keeps it more secure) in the one pocket and then put my travel wallet (ID, credit cards, cash, boarding pass and passport) in the other with a pack of tissues and my lip balm. Convenient! Now when I go through security, everything is right where I need it and I can take off the Napper and put it right in a bin with my shoes. Once on the plane, I can put my wallet back in my carry-on and instead use the pocket to keep a pen and puzzle book. A pen is always a useful item to have when traveling, and it’s even nicer to not have to rummage in a bag to find one, and we all know that there’s barely room to spare on a plane anyway. Does your neck or hands get cold when you travel? The Napper can keep you warm. The scarf is long enough to wrap around your neck for extra coverage and the deep pockets are nice and cozy to envelope your hands up to the bottom of your long sleeves, so you don’t have icy wrists. If you’re someone who travels a lot on the bus or train, it can be important to keep your valuables and travel docs close, especially while you’re sleeping. 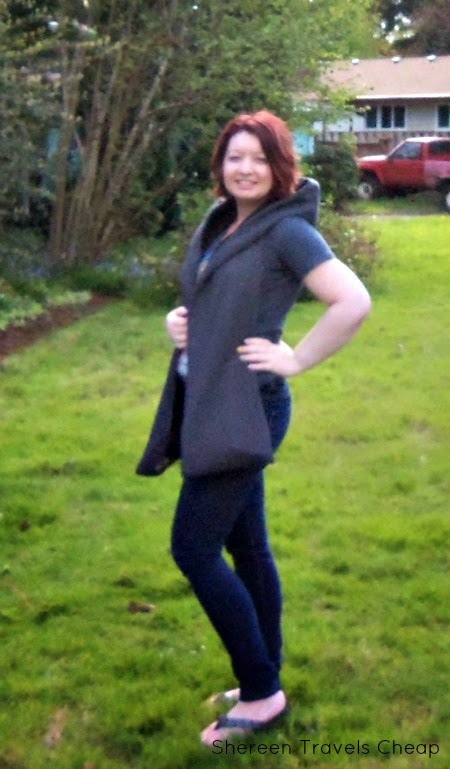 The Napper allows you to do that, plus the pockets face your body, so nobody can tell you are even carrying anything on your person. This can also be great when you’re just walking around a city in the cold. Keep items from the prying eyes of thieves while keeping yourself warmer in the process. Just wearing the Napper around home? Keep your gloves in the pockets, so you’ll never lose them. Got the opportunity to lay down somewhere? Fold the Napper back up and use it as a real pillow. This item is so versatile and useful, you’ll want to buy one for everyone you know who travels or has a long(ish) commute. With Mother’s and Father’s Day coming up, you might have just found the perfect gift. Napper doesn’t require special care either. If it gets dirty, just toss it in the washer with your other laundry. Even the earbuds are washable. Disclaimer: I was provided with the Napper for the purposes of this review, but all opinions are 100% mine.